Emed > Heart Disease - Cardiovascular Disease > Folic Acid, Folinic Acid or Methyl Folate – Which is Best? Hopefully this article answers some of your questions. The term ‘folate’ encompasses several different vitamins with varying activity, metabolic pathways and absorption. 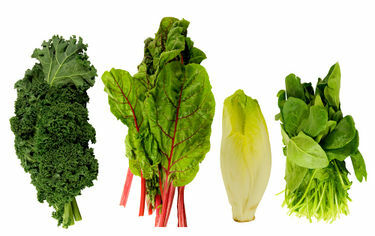 Naturally occurring folates are richest in green leafy vegetables. These natural folates are easily damaged by storage and cooking processes. Folic acid, is the common supplemental form which was designed to be highly stable, however it does require activation in the body to exert its activity. Folinic acid is the formyl form of tetrahydrofolate and is rapidly converted to methyletrahydrofolate (MTHF), bypassing several steps involved in the metabolism of folate and rapidly increasing plasma levels. Methyl Folate (5MTHF) has just been approved by the TGA and is now available in Australia. Bioceuticals MTHF & Research Nutrition L-5MTHF are now available through Emed. Folinic acid is utilised to overcome the metabolic issues associated with the common inherited gene polymorphism known as c677T MTHFR. The polymorphism results in a unstable methylene tetrahydrofolate reductase (MTHFR) enzyme, with up to 50% of the population affected. 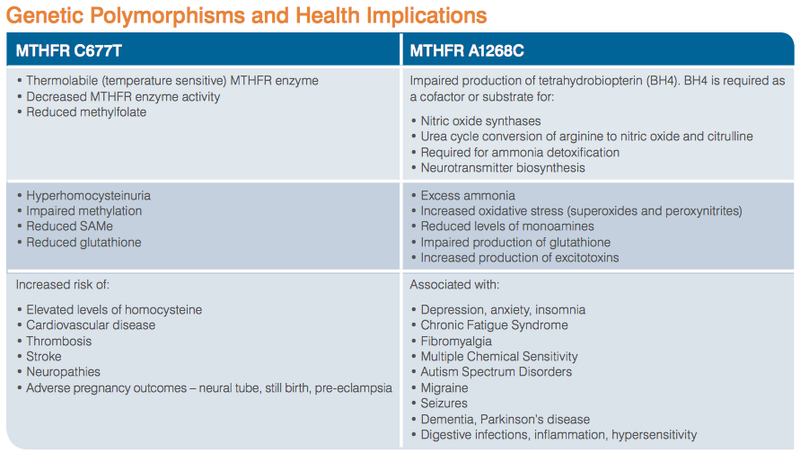 MTHFR plays an essential role in homocysteine metabolism and those who are homozygous for this gene are more likely to have impaired methylation and folate metabolism. Activated folic acid (folinic acid) and 5MTHF bypasses this biochemical pathway. There is much conjecture regarding potential toxicity of folic acid for those with MTHFR polymorphisms. Those who are heterozygous (have one copy of the polymorphic gene) for the C677T MTHFR polymorphism may have up to 40% loss of enzyme function, and up to 75% for those who are homozygous (have two copies of the polymorphic gene). It is important to remember it is extremely rare that an individual has complete loss of enzyme function, and therefore supplying the cofactors for MTHFR enzyme function is beneficial to enhance MTHFR activity; the nutrients required for the are vitamins B3, B6 and B12. There is some confusion regarding the theorised potential negative effects of folic acid for some individuals, with some suggesting that folic acid blocks the MTHFR enzyme. Genetic testing for the MTHFR mutation is available. To test for mutations in the MTHFR gene, purchase an easy to use testing kit by clicking here. Research has demonstrated that doses greater than 400mcg of folic acid may result in detection of un-metabolised folic acid in the blood. Tresos Activated B PluSe provides a daily folic acid dose of 250mcg and folinic acid dose of 250mcg. Bioceuticals Folinic Acid provides 500mcg folinic acid per capsule. Is Folic Acid use Associated with Cancer? A concern amongst some practitioners is a postulated association between folic acid use, both in supplements and fortified foods and cancer incidence. A 2013 meta-analysis published in the Lancet found no significant association between folic acid use and cancer incidence. In conclusion, researchers stated that folic acid supplementation does not substantially increase or decrease incidence of site specific cancer during the first five years of treatment. What benefits are there in using activated Vitamin B2 and B6? Eagle comprehensive Tresos Actiavted B PluSe contains the metabolically active forms of vitamin B2 (riboflavin-sodium-phosphate) and vitamin B6 (pyridoxal-5-phosphate). These active forms of B-vitamins bypass the metabolic pathways required to convert standard B-vitamins to their biologically active forms within the body. P5P is the active coenzyme form of B6 and its biological roles include synthesis of hormones and neurotransmitters, haemoglobin biosynthesis and glycogen metabolism. Along with folate and B12, P5P is involved in the folate and methionine-homocysteine cycles and helps maintain normal levels of plasma homocysteine. It can be very confusing when a new form of a vitamin or mineral comes out on the market so folinic acid and 5MTHF are no exception. As it is metabolised easier than folic acid, its the obvious choice for supplementation especially for carriers of the MTHFR genes. Folinic acid will slowly replace folic acid in many supplements as the known occurrence of the MTHFR gene variants increases. To take the MTHFR test, click here. As it is stated above, folic acid is not harmful for MTHFR carriers it is just metabolised at a reduced rate. If you have any further questions regarding folic acid, folinic acid, MTHF or MTHFR gene variants or testing – talk to your Emed Practitioner Today! There is plenty of anecdotal evidence of folic acid supplementation making some people ill. Folic makes me ill even when taking 5-MTHF as well, which on its own benefits me. There is a paper on the American Society for Clinical Nutrition website, titled ‘Is folic acid good for everyone?’ by A David Smith,Young-In Kim, and Helga Refsum, about ill effect from folic acid. You can test for the MTHFR gene via a cheek swab test. The buccal swab sample is the gold standard for any genetic testing. We choose to test our patients this way (instead of blood testing) as we have found it to be the most accurate. For more information on this testing kit, please refer to the information card below.